This family tree is the result of almost forty years' work collecting and processing genealogical data on the Verwa(a)ijen family. It is reproduced in Genealogie Verwa(a)ijen, which is illustrated below. This book was published in October 1993 in an edition of over 300 copies and distributed to those interested. The earliest recorded ancestor of almost all Verwa(a)ijens who have been traced was Hendricus Verwaeije, whom we know to have been a member of the sheriffs court in Ooij close to Nijmegen in 1494. Below is a detailed discussion of his ancestors - and the probable links with the knightly "van der Waden" family in Over-Betuwe, whose existence was recorded as early as 1260. Where did they come from? Whenever you relate something about the Verwa(a)ijen family tree, this is virtually always the first question asked. After decades of researching and identifying the most diverse namesakes, this question can he answered with a fair amount of certainty: in the eastern part of the Netherlands, close to the German border, where the rivers Rhine and Waal bifurcate, we find our land of origin. In the distant past, this area, in the large valley between Montferland and the fringes of the Kleve Reichswald, was by no means a very hospitable region. Across the whole Guelders Gate, the rivers Rhine and Waal streamed unhindered into our native estuary, finding themthelves a path in the process. Without human interference, the river would constantly change its course and the midstream channels would continuously change their positions. Bends will erode in an outward direction and, as the water supply increases, this effect is magnified. This happens in particular in springtime, when there is a lot of floating ice. Suddenly released ice floes create rapids upstream and as a result the force of the stream increases. Bends in the river are displaced in an outward direction, shallows appear, silt is deposited and accretion of land takes place. Sand and gravel are swept along, and slowly riverbanks arise. However, these riverbanks did not comprise a dosed barricade against the water. As a result of countless gaps the river streamed freely into the surrounding lands. Each time the frequent inundation's left a thin layer of sediment, and slowly but surely built up thick layers of river clay, which later would become the basis of the local brick industry. Herein and with hard labour many Verwa(a)ijens would eke out a meagre existence, a select few of them however would make their fortune in this industry. Sometime during this process of land accretion, people started to settle down in this area. Less than three hundred successive generations left their traces in this territory, except for a few rare archaeological discoveries from a more distant past. Measured against the history of humanity, the above is negligible. In the search for the origins of our forefathers, however, we barely go back eighteen generations and of the eldest of these we find only scant proof of their existence and very few other details. With the above statement this effort at historiography has been immediately placed into the right perspective. Initially our ancestors were completely exposed to the unpredictable and capricious water in their environment. About the ninth century they started constructing the first dikes to protect their houses and lands against the free flowing water. This was a tiresome and laborious task and the numerous breaking of the dikes, which continued well into the twentieth century, show that the water was not easily restrained. Characteristic of this area are the many "kolken": deep pools of water in those places, where the scouring water once more turned out to be superior over the dike builders. These "kolken" were also known as "wiel" or 'waai', and this last denomination brings us to the possible origin of our family name. In the "middelnederlands" dictionary of Pijnenhurg and v.d. Yoort vd. Kleij, we see under "wade": 'kolk, scour-hole, deep pool of water". An eminent authority in the field of regional history, mr. A.G. van Dalen, published an impressive sequence of publications on our land of origin. In these, he repeatedly links the old, knightly lineage "van der Waden" to the name "Verwa(a)ijen". In his book "Rondom het Tolhuys aan Rijn en Waal" he states: "...the knights and servants mainly originated from families as van Hoeckelum; van der Meer, later on Vermeer; "van der Waden", later on "Verwa(a)ijen", die Beijer, die Meij, van Avelaick, whose ancestors can he found as servants and vassals of the liege lord, during the thirteenth and fourteenth century, in this manner "gemeine erven, van hoeghen en leghen adel" (common descendants of high and low nobility)...". "...Werner ter Waden, whose spouse belonged to the servant class, was probably a representative of the lineage van der Waden, which one frequently comes across in Pannerden and Herwen during the fourteenth and fifteenth century. It probably originated Som the mansion "Die Waede" or "De Poll' near Huissen...". "... Thus it happened in Pannerden to the lineage "van der Waeden", knightly even. In the sixteenth century, however, one and the same person alternately is named "van der Waeijen" and "Verwa(a)ijen"..."
"... with the memory of the knightly lineage lost, the nomenclature was arranged according to daily use, in the same way that "van der Waden" became here: "Verwa(a)ijen"..."
The above-mentioned estate "Die Waede" ("De Waeij") or "the Poll" is situated just a few miles Southeast of Arnhem, in the southern corner of Huissen, exactly on the border with the settlement of Angeren. It consisted of a number of buildings, surrounded by walls and moats. The whole was surrounded by estates, situated on the Huissen (i.e: Klevian) and on the Angeren (i.e. : Gelders) area. In 1982 an archaeological survey was carried out in this place. Cultural relics from the beginning of the fourteenth century up to and including the eighteenth century were discovered. Drilling operations showed that even prior to the fourteenth century people occupied a house on the very place of the former knightly buildings. The first written record of the mansion "Die Waede' (the denomination "De Poll" came into use not earlier than the beginning of the seventeenth century) is dated June 8, 1347. This annotation is found in a charter, which was provided with the townseal of the town of Huissen. Henricus de Walla, Judge in Huissen, and Cesarius Mechtildis, as well as Gerard Duemen, Alderman of Huissen, ratify, that Philippus de Heecker yields his possessions in Wada, named "dat goeth in der Waden", to Lord Theodoricus de Bilandt, Knight. Up to the year 1487 the property stayed in the possession of the van Bilandts, who never lived there themselves, but gave it into feudal tenure to others. According to van Dale, we must seek the first "van der Waedens" and therefore also the first "Verwa(a)ijens" among those "others". Study of source material and soilstudies show that the estate originated from a knightly homestead. In the fourteenth century such homesteads consisted of a simple dunjon or residence tower and some outbuildings. It was the usual kind of accommodation for members of the knighthood, especially for those members with modest means. A number of old charters mention a few members of the van der Waeden lineage. In the book: "Uit de oude historic van Pannerden" (AG. van Dalen) we come across the first reference of one of the van der Wadens. In the year 1260 a contract, concerning a Guelders- Klevian marriage, is drawn up. On the side of Count Otto II of Guelders a number of distinguished noblemen, as the sovereign lords of Bergh, Wisch and Batenhurg, appear. On the side of Kleve appears amongst others: "... "Jan van der Wade" of a "ministerial" lineage from a mansion in Angeren, of which a branch was established in Pannerden most certainly since the fourteenth century ". "Ministerialen" were knights in service of a liege lord. Each sovereign lord owned serfs, i.e. people who had the usufruct of a predial estate and there fore were obliged to render services. These services could mean military obligations. The "ministerialen" originate from the category of serfs, these people served their sovereign as knight with armour and horse, and were also often used as office-bearers. The military power of a sovereign lord was therefore based on his landownership. The more "curtes" with serfs (i.e. : farmsteads with subordinates) he possessed, the more people he could add to his military potential. This system was developed in a society, where hardly any money circulated. Up until the twelfth century the northwestern part of Europe was an isolated area in the global situation. Worldtrade mainly took place in the countries around the eastern basin of the Mediterranean Sea: Italy, the Creek countries around the Aegean Sea and the Arabian countries. This isolation restricted trade by barter. There was no trade of any dimension, nor any industrial activity working for commerce and traffic. People lived in a pure agrarian economy, in other words: the products of their own soil had to provide in the bare necessities of life. No money circulates if there is no trade by barter and quid pro quo for rendered services had to pay in kind. The serfs, who had the usufruct of a predial estate from their sovereign lord, had to hand over a part of their production. A sovereign lord, who demanded services from his people, had to provide in their maintenance. He often did so by awarding land to them, according to the value of the demanded services. Apart from serfs there were also vassals. A serf was not a free man. This meant, that neither he nor his descendants could end their obligations except by consent of the sovereign lord. A serf rendered his services by virtue of his serfdom. Possession of a predial estate was the reward for it, or better: the usufruct of the estate was the reward, by which he supported himself. On this estate, however, rested the annual obligation of delivery of a certain part of the production to the court of the sovereign. Accordingly, since the twelfth century the circulation of money started to increase, the annual obligations gradually changed into fixed annual tithes (partially or wholly). A vassal, however, was a free man. He was considered to hold in feud an estate from the lord, i.e. he had the usufruct of it, and as a service in return he delivered military service. One could say, that to a serf the usufruct of the estate was a salary, whereas to a vassal the rendered military service was payment of interest. As a free man the vassal could break the contract by returning the estate to the sovereign. A vassal was considered to he of 'higher" birth than a servant, just as a freehold farmer in our society is held in more esteem than a leasehold farmer, even though a farmer with a larger leasehold can he higher up the social ladder than many freehold farmers. This way a serf could he socially far more weighty than a vassal. It simply depended on the office he held and in whose service he was. As the importance of a sovereign rose, so did his serfs'. And as the serfs moved into more important positions, the class of "ministerialen" came into existence. They were the servants of knightly stature, socially equal to vassals or even surpassing them. 1.June 26, 1326: (feria sexta post festum beati Joannis Baptisti) Gerardus van Baersdunk, Judge in Bethue, ratifies, that Theodoricus Harolt and Mabylia, his wife, together with Messr. Petrus, priest; the brothers Wilhelmus and Rabodus, sons of Theodoricus and Mabylia; Gosuinis de Wade and Hermannus, children of Mabylia; and Margaretha, sister of Theodoricus, together have sold a garden, named "Bunghaerdt" in the parish of Angeren, a piece of land named "Campstucke" and a piece of arable land named "Langhebeme" to the Commandator and Friars of the House of Johannis of Jerusalem in Arnhem; whereafter they leased these goods at "tien pond klein penningen" annually. 2.April 6, 1322: Joannes de Wade, together with five others, stands surety. 3.In 1325 Hermannus, Goswinus' zoon van Wade, leases a piece of land, situated in De Winckel in Angeren at 2½ pounds of candles annually. 5.March 12, 1380. statement of the Plebaan of Wesel, that Jobya, sister of the late Messr. Theodoricus, Plebaan of Biesten, acknowledged to have payed in his name 3 Marks to Gerardus Nyle in behalf of Bertrandis van der Wade. 6.In the year 1422 the municipality of Nijmegen buys, among other things, a young heifer from Goessen van der Waeden at 4½ Arnhem guilders. 8.In the year 1441 Arnt van der Waden is mentioned in a stewards account as tenant of "De Bouwhoff in de Bylandt", whereas Jan van der Waden also is mentioned. 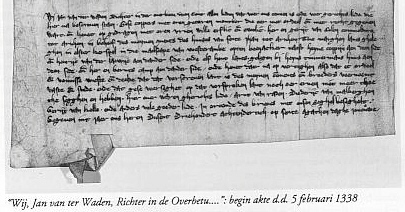 9.May 17, 1442: Beert van der Waeden gives her son Johan van der Waeden power of attorney to dispose over a tithe from her goods. 10.In the year 1449 Arnt van der Waeden lives in one of the four farmsteads situated around the "slot Dorenhurg" (i.e. the present Castle of Dorenhurg). 11.October 29, 1459: Theodorus Buck, priest, Arndt van der Waeden and Jacob van Hokelum, churchwardens in Herwen, ratify the transfer of the interest etc ... 12.February 14, 1460: Hendrik van Aerde and Ermgert, his wife, sign a confession of guilt to Wilhelm, Lord van de Bergh, Bijlandte and Hedell in the presence of Arnt van der Waeden. 13.In the steward's account over the year 1462/1463 both Arent van der Waeden and Johan van der Waeden are mentioned. 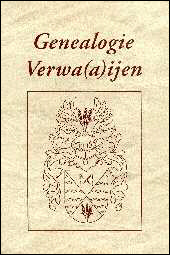 In every respect it seems indeed acceptable, that the Verwa(a)ijens descended from the van der Waedens and that the first traces of our family are to be found in the Huissen-Angeren border region. In spite of its knightly roots, the Verwa(a)ijen family later on became part of the agrarian class. The fact that Hendrick Verwaeije, our eldest ancestor, acted as alderman of the council in Ooij in 1494, points out, that his environment looked up to him with considerable respect. This also applies to his grandson Petrus, who - as we shall see later - rose to the position of dike- reeve (holm keeper) and workmaster under Wilhelm, Lord van de Bergh. Petrus' son Gerardus was alderman of Gendt and his grandson Henricus was an important man, not only churchwarden in Leuth, but also alderman, and in the year of 1680 even mentioned as stadtholder. With inventorynumber 5000 a heayily damaged list of dike-taxable people is kept in the archive of the House Bergh, Rijksarchief Gelderland, Arnhem. These people were obliged to help with the regular upkeep and normal maintenance of the dikes, apart from the repairs after dikeburstings and similar calamities. This was because every landholder was responsible for the maintenance of a certain length of the dike. Therefore the dikes were divided in so-called blocks, indicated by stakes. According to the largeness of the landed property, everybody had one or more blocks (sometimes only a few Dutch rods at 3.78 metres) to his responsibility. Three times each year (in spring, midsummer and autumn) the dike-reeve and his board of inspection surveyed the dikes in order to establish as to whether those responsible had fulfilled their obligation, as required under the existing polder regulations drawn up by the polder authorities. Lessors shifted these obligations to the tenants. A lease always included a clause making the lessee responsible for the maintenance. The above mentioned list therefore includes tenants as well as small landowners. “... with Derick Vermeer, we once again meet up with a well known family. Formerly, one usually wrote: van der Meer, so a development as at the manner of writing: van der Waeden, van der Waeijen to: Verwaeijen ...”. After the inundation of 1578/1 579, voluminous reparations had to be carried out. With regard to the village of Pannerden an account thereof remained in the archives (archive House of Bergh, inventory number 5057, Rijksarchief Gelderland, Arnhem). The account concerns the supply of material, transport of material and labour at the dikes. Supply and transport of "vimmen” (i.e. : each time 104 bushels) of wood, of “slieten” (thin copse sterns, the branches stripped off) and stakes, the cutting of wood, supply and transport of dung. From this list one can learn, that at first there has been hard labour to fortify and heighten the dikes, where a collapse threatened. Wooden cases were put up and filled with dung trying to prevent overflowing, whereas later repairwork was done to the dike, which nevertheless had burst. Therefore the inhabitants were called up as day-labourers whenever was necessary. Among these inhabitants we come across Peter Verwaeijen, the man who is appointed dike-reeve of the “Bergische Waard” in Pannerden by the Count van de Bergh on September 4th, 1581. Apart from the continual struggle against water our ancestors had to deal with many more inconveniences, discomforts and misery. The region received more than its fair share of war- violence, not just in the vividly remembered period of liberation during the last world war, but also some four centuries ago. The battle between the Spanish and the Dutch State troops transformed large parts of Guelders into scorched earth. The rural residents of the Betuwe, the Liemers and Meuse and Waal were impoverished by the heavy contributions imposed and levies exacted under threat of pillage and fire by both of the warring factions. Entire villages were deserted, the residents fled, their houses were demolished and burned down. The bubonic plague and other epidemics spread like wildfire among a population who, as a result of starvation and misery, had little or no resistance. The fields were left fallow and untended. The strategically extremely valuable entrenchment at Berghse Hoofd was taken and re-taken no less than four times in space of one year. This region was subjected to a whole scala of historic warfare. We only know a skeleton of facts and dates without further detail. One can only guess the suffering of the population, but reading that the local authorities of Nijmegen demanded, that the entrenchment at Berghse Hoofd should either be retaken or additional entrenchments against it should be put up to: “prevent soldiers from running out”, should give a fair indication. Looting, warlevy exacted under threat of fire and fights to the death must have been regular occurrences in this period of time. Spaniard or Geus (i.e. : Papist or Protestant), it was all the same to the population: “De Geus die wil ons hencken, de Spangiaart sal ons krencken” (: the Geus is going to torture us, the Spaniard is going to mortify us), said a well-known short rhyme in those days. One way or another: the farmers always had to pay the piper. In spite of all the tribulations our ancestors managed to survive and to keep their ground until today. A universal Verwa(a)ijen-coat of arms was not found. The well-known "Collectie Muschart", in which the names van der Wade, van ter Wade, van der Waden, van der Waeden and Verwaijen are mentioned, can be found in The Centraal Bureau voor Genealogy in The Hague. A great number of seals, including the seal of Arndt van der Waeden with three slanting bars from top left to bottom right, attached to the above mentioned document dated October 29, 1459 (no-1 l). In the Muschart-collection we find an index-card regarding a seal, attached to charter nr. 2948A in the ducal archive of Guelders, a letter of alliance between the knighthood and the towns of Guelders, dated april 17th, 1436. “Aernt van der Waeden, squire” signs this letter on behalf of Nijmegen and its region. Muschart describes this seal as: “three slanting bars with the name van der Waden” as circumscription, so no doubt this concerns the same person. Furthermore Muschart mentions a seal of Lambert van der Wade, who was alderman of Culemborg in the year 1396 and who concludes a marriage settlement with Gertruut, daughter of Henric Rijebeek. Lambert's seal is described as: "three columns, attended with a small star between the two upper columns and a toothed edge around the shield". Another Lambert, whose surname is spelled: van der Waeden, rums out to he Judge in Xanthum on September 2nd, 1515. This Lambert has a seal with: “a cross-bar, attended with a lime-Ieaf in the top right” and as circumscription the name van der Waeden. Incidentally, in the text of this document the surname is spelled: van der Waeijen. We also know the sign, which alderman Gaerdt Verwaeijen in Gendt had attached to charters, made up in his presence as a member of the Gendt judiciary. The sign is extremely simple and has two variations, both based on the same basic theme. Gaerdt acts as Alderman of Gendt on May 16th, 1615. His seal, covered with rhomboidal paper, is on a document in the archive “Civiele Processen van het Hof van Gelderland”, the year 1620 II (Rijksarchief Gelderland). Other documents furthermore state, that Gaerdt Verwaijen is married to Jenneken liffers and lives in Gendt on January 6th, 1617. Jenneken is illiterate, Gaerdt is with surety a farmer, for he speaks of his plough, which was cultivating his field". Many people, who could not read or write, used a mark as signature as depicted above. Even today one can find these marks in the shape of a “house-sign” very often, for instance a cramp iron in the front of a house. In the Muschart-collection we find yet another sign, based on the same foundation. 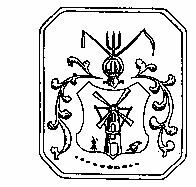 On May 4th, 1634 Jan Ver Waijen is Alderman of Bijlandt and Millingen and uses this seal; it is found as a seal covered with a rhomboidal paper in the archive “Civiele Processen van het Hof van Gelderland”, the year 1637 II (RijksarchiefArnhem). In view of the similarity in shape of this mark and the one used by the abovementioned Gaerdt, it seems acceptable that Jan and Gaerdt are brothers. Finally, there is the coat of arms used by the Verwa(a)ijens from Griethausen (Germany) in the beginning of the previous century. It is certainly not a noble coat of arms nor is it mentioned in heraldic registers. Most probably it is inspired by the source of prosperity in this branch of the family: the corn-millery. The picture of a corn-mill is clearly recognizable on a shield in this metal seal, formerly in the possession of late mr. Ernst Delheek in Kleve (Germany). The vanes are set in the shape of a cross of St. Andrew at an angle of 45 degrees. In "miller-language" this means, that the mill will be inoperative for an extended period of time. Above the shield we see a helmet-cover and a helmet on top of which a flail, hayfork and scythe. The mill itself is flanked on the right side by a sheaf of corn and on the left side by a farm cart, loaded with sheaves (?). The colours of this coat of arms are unknown. At the moment the number of living descendants of the Verwa(a)ijen-family is relatively small, although the extent of this genealogy perhaps gives different impression. An educated guess adds up to about seven hundred living family members. In the avent of a possible family reunion, this would truly produce an impressive group-portrait, but seen in relation to the total population of our country, this is a small number. In the process of composing this genealogy this became abundantly clear. Up till now virtually every Verwa(a)ijen that was 'unearthed' could be put into place within our family with little or no trouble. A small number of them is spreadout over the world. Today we find family members in North and South America, in Canada, Asia, Australia, South Africa and various European countries. One must not be surprised, that above all things Germany- and especially that part bordering on the original Dutch region accommodates so many family-members. Natural barriers, such as the great rivers, often formed a barricade more difficult to pass, than the official frontiers. Not only did the latter repeatedly change position, but while passing those frontiers, one did not or hardly ever have to comply with formalities. Also in the historical enclaves in our area members of our family left their traces. These enclaves were of the old Klevian-Prussian territories in our country, such as Hulhuizen, Huissen, Zevenaar, Liemers and Wehl. Especially Hulhuizen was of the greatest importance to our ancestors, who were mainly Roman-Catholic. After the reformation in many areas it was no longer possible to fulfil Roman-Catholic obligations as taking the Sacrament at Easter and religious marriages or baptism, contrary to places like Hulhuizen however. As one can still see today in the registers of baptism and matrimony in our archives that people from many miles around came to these enclaves. Yet it is quite remarkable, that even today many Verwa(a)ijens live so close to the place, where the first were found six centuries ago. If one draws a circle on a map and takes the abovementioned mansion “De Waede” as the centre, he only has to make a radius of about twenty kilometres to include the majority of all the Verwa(a)ijen descendants. As for the remainder, by going back a few generations you can trace them to this area as well. It goes with out saying that the Genealogy Verwa(a)ijen which follows this introduction is far from complete, while undoubtedly here and there mistakes have sneaked in. The computerisation of archives shall no doubt produce far more names, dates and details about out ancestors in the future. Also bear in mind that as this is written, children are born, people get married and die. Therefore this genealogy of our family will never he complete and that is just as well. Thus the coming generations in their turn will have the opportunity to contribute to these chronicles of the Verwa(a)ijens family.